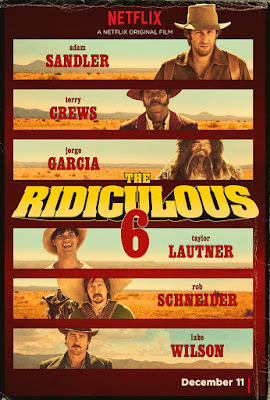 THE RIDICULOUS 6 deals with a group of unfunny half brothers (led by the insufferable Adam Sandler) who set off on a robbery spree in an effort to save their father (Nick Nolte) from the clutches of his old gang who's now holding him for ransom. Tumbleweeds have more life in them than the racist jokes and DOA gags that follow. This insanely long wagon train is available exclusively to stream on Netflix, but as always, you're better off letting us tie this one to the cinematic gallows and finding some other horse to ride off into the sunset with.